Wondering if that boost of energy you get from Shakeology comes from caffeine? Well, it probably is not. Especially if you are drinking Greenberry because it has 0 caffeine in it. The rest of the flavors have trace levels of caffeine. From what I could find, the green tea extract in Greenberry is decaffeinated. Chocolate Vegan and regular Chocolate both contain minimum levels of caffeine from the cocoa in those formulas. Beachbody has said Chocolate Shakeology contains about 18mg of caffeine. 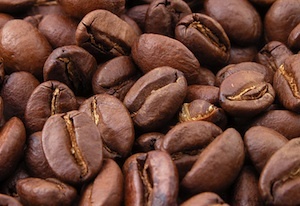 A regular cup of coffee has 75-100mg while a cup of decaf coffee has 2-15mg in it. At 18mg of caffeine, Shakeology is similar to a cup of decaf coffee. Not once in my seven years of using Shakeology on a daily basis have I felt the ups and downs like you would from drinking a lot of coffee. I still have a cup or two of coffee every morning with Shakeology. But typically I feel a smooth and consistent energy throughout the day and my best guess is because of all the nutrition in Shakeology. But if you’re looking to kick a caffeine habit completely then go with Greenberry Shakeology.